And let me tell you about “You” <– When I read it, I was more into “dark-romance” reads, and this one, while it IS a “love story”, well… it didn’t get me in the romance-feels, ya know? SO while I enjoyed the creep-factor, and dreaded where it could possible go (and I love dreading stuff… in books!! Always and only in books), I just didn’t find myself connecting at all to Joe. The “Hero” (actually… the ANTI-HERO, and that’s being conservative). 😉 So I liked it. But I didn’t LOVE it. But I kinda did love it, because I GET it, now. And I love it. Here’s that review. In fact, that book just STAYED with me. Every detail, his thought processes, his need for love and affection, and his hipster-safe “feel’ (but his psychopathic ways), hooked me for the long haul. Because 2 years later, now that I’m TOTALLY into psych-thriller stories that aren’t necessarily “romance-centric”, I HAD to up my rating for it. This is one of the rare books that I never have to backtrack over my review, or skim it, to remember it. The title alone evokes all sorts of memories, and personal reactions, and I have a certain, strange fondness for it as a whole. In fact, I was craving more. And my wish came true!!! ‘Cause the publisher sent me the sequel (the paperback version), and I wanted to read it so badly that I went “old school” and loved every minute of it. Well the book, at least. Not my hands so much. My hands and wrists (and my palm muscle thingie near my thumb) developed cramps, I couldn’t use my magic highlight finger, and I’m gonna admit something shocking, right now. Something I chastised my own sister for (in the past). I committed atrocious crimes against the book late one night, when I ran out of “post-it note” strips, and was too cozy in my bed to get out and find more. And so… I folded down TWO pages where there was some really good stuff that I wanted to remember. *gasp*!!!!!! I am. I thank her and keep walking. …his talent for many things, and handsomeness fools just about… everybody. Delusions of grandeur. The need for what he considers “justice”. And he believes he knows better than everybody. Except often he doesn’t know better. And he’s been (and continues to be) fooled and shamed by his own trust and need to be a part of something. A part of somebody. His need for just being… battles with his need for not. I might become so happy that that I wouldn’t be me anymore. THAT right there… sums up so much. And so he must rid the world of this scourge. A fat kid on the first floor asks me where I’m going. “To make the world a better place,” I answer. I give the kid some books, none of them rare, all of them important. The kid is grateful. and I’m noble and it’s true. I am going to make the world a better place. But not everybody is scourge to him, although at times it comes close, so this one will keep you guessing, and biting your nails right to the very end. It’s different ’cause it’s subdued, and not so in-your-face-scary. But it still manages to creep you out like no other. Because who knows if we have a “Joe” in our own entourage? Our very best friend? Our latest business partner? Our newest crush? Or the love of our life? What if? Right? And this one presents that exact possibility, through HIS POV. So this one? It continues exactly where book #1 left off, and now? Yes. Like I mentioned earlier (in another post), I’m wickedly (and not in a good way ’cause some are crazy!!!!) attached to the characters. Specifically, the one and only psycho… Joe. We are happy. We don’t need you, any of you. We don’t give a f**k about you, what you think of us, what you did to us. I am the driver and Amy is the dream girl and the is our first vacation together. Finally. I have love. Because it always stems from that, doesn’t it? Is it weird that I almost felt like I was rooting for the bad guy? That I could be so worried for him (or maybe I was just stressing WITH him), so often??? I forgot to take the mug. That f**king mug haunts me. I understand that there are consequences. I am not unique; to be alive is to have a mug of urine out there. But I can’t forgive myself for screwing up, like some girl “forgetting” a cardigan after a one-night stand. The mig is an aberration. A flaw. Proof that I’m not perfect, even though I’m usually so precise, so thorough. ‘Cause while he’s absolutely out of his mind, and a scary psycho that you never want to cross, or even have in your life, he has his insecurities. And logic. Or at least, his “human” side developed a whole lot more in this one. Oh don’t get me wrong. In a way, it’s even more unbalanced than the first, but it’s almost like he becomes a vigilante of sorts. It’s just that… his targets (while many are deplorable in their own right), don’t necessarily deserve the wrath he dishes out. But I’m stopping there. There is a TON of story here. Getting to know him. Getting to know those he hates. Getting to know those he loves. And some of them are one and the same. But this one made Joe real to me, and had me FINALLY connecting with him. I’ll tell you. There’s something incredibly disconcerting in clapping with *glee* and relief when things go RIGHT… for the bad guy. And that says a LOT for an author, that has her readers connecting to a serial killer. Just sayin’ 😉 You don’t always agree (actually, let’s just pretend we NEVER agree), but we still can’t help but devour his life, as he devours others. 4.5 stars! <— Yep. I liked it even better than the first. And without a doubt, I will be reading the next one IMMEDIATELY upon release. P.S. Thank you to the publisher for sending me this review copy. I absolutely LOVED You and Hidden Bodies. I listened to both of them, and the voice actor that was Joe was just incredible. It’s not the kind of story I generally read, and it made me really rethink what I put out on social media, lol, but it was such an interesting story. Joe was so wonderfully wicked, and so completely unapologetic about it. Just reading the quotes above took me back to Joe’s voice. Great books! 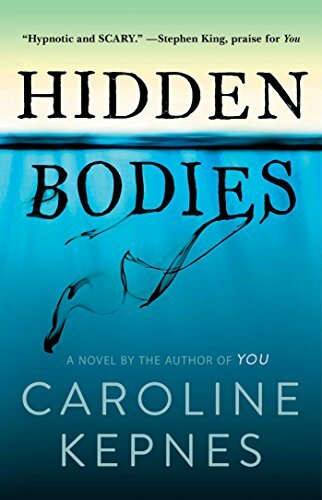 Even though you’ve already read it old-school, Hidden Bodies is an Audible MUST LISTEN!! Narrator, Santino Fontana, nails Joe-the-sociopath, giving him depth and humor as he moves to LA in search of true love and some honesty. Seriously, give it a listen – you will not be sorry!! Maryse, have you read the Dexter books? Reading this review brought the series to mind, and I can see you liking it. Hey, what if Amy’s husband is named Joe? Spooky. Great review Maryse! I didn’t realize there would be a third?? I had sort of an opposite reaction I think. I liked the first book better. But it could be because I read the two books relatively close to one another. You was just so shocking to me. And I totally agree that there is this appeal to him and you see his logic… Such good books and am so curious about the next one!!! Tessa this DID have a sort of “Dexter” feel!!!! Heather, thank you for the heads-up on the audiobook. It would have to be an amazing narrator to”do” Joe. LOL!!! marina… just the way #2 ended, I just KNOW there is a 3rd. The author is keeping mum about it for now, but everyone is asking when #3 will be out. What is a Pushkin, bev?? I must have forgotten how it ended??? How is that possible? BUT I just today found it at the library on a book sale rack and bought it so will reread the end for sure as soon as possible! I’m afraid to admit I was oddly attracted to Joe. But that’s what’s supposed to happen right? Please say yes. I read You and loved it. I didn’t realize this was book 2! I am dying to read this one. I love creepy stalker type books! Yay Lori!!! I can’t wait to hear what you think! !